An icon rumble contest for rock & metal fans. SIGN-UPS FOR ROUND 2 ARE NOW OPEN. Go here to earn up to 4 bonus points for simply PROMOTING the community. 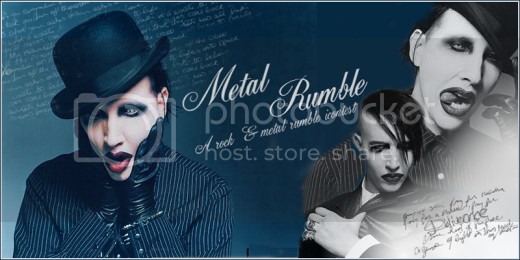 Welcome to metal_rumble, a new challenge icontest community on LJ for rock & metal fans. Instead of eliminating icons (as in a LIMS contest) participants have to gain as many points as they can throughout each set of 10 challenges in a round. The participant at the end of the round with the most points wins. ~Members MUST be signed up to participate in the challenges in the current round! ~No requirement to enter every challenge, but skip 3 in a row & you will be disqualified. ~All participants MUST enter Challenge 1 of the Round. ~All icons submitted must not have been made previously for other contests & must be your own work. ~Icons must fit LJ standards, i.e. 100x100, less than 40kb & JPG or PNG format. ~Do not post challenge icons anywhere until the voting for that challenge is over. ~Only 1 icon per challenge(unless otherwise stated). ~Always read individual rules for each challenge carefully. ~Ask creator's permission to use icons & credit posted here. ~Don't vote for yourself or ask others to vote for you. ~Please join the community, you must be a member to participate. ~Get creative & have fun! For a list of past challenges or to make a suggestion for future ones go here. Sundays ~ Voting begins. Next challenge in the round posted. Want to affiliate with this community? Comment here. Thanks to disney_rumble & btvsats_rumble for inspiring this community!